With the engine oil pipes not being fitted until Monday, and needing some things we could only get in Auckland, it was a last minute (10pm Friday night) decision to try and book a car to go down to Auckland on Saturday. The aim had always been to catch the commuter ferry from here (Gulf Harbour), but it only goes on weekdays and all our weekdays have been taken up trying to get the engine fixed. So we were ready and waiting on Saturday morning to catch the 07.59 bus to get to the car hire garage, but it wasn't to be a good start to the day as the bus didn't actually turn up until 09.25! And then, having picked up the car and on our way to Auckland, about 40 minutes away, it started to rain. 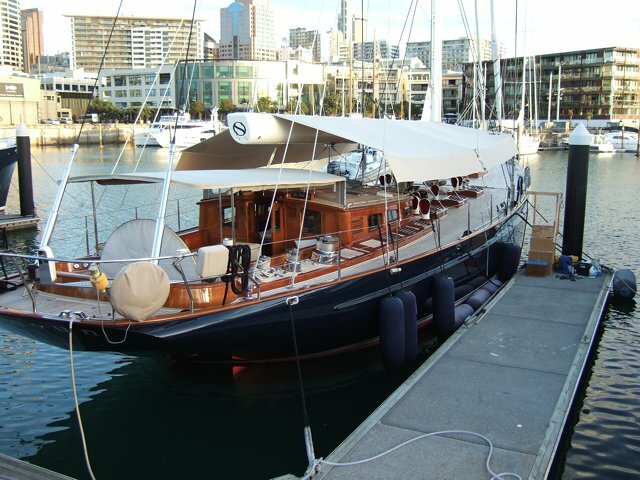 We've been to Auckland quite a few times, but always from a long way away (6 hour round trip drive) to drop things off and pick things up, like the liferaft for servicing. Every time it had rained. 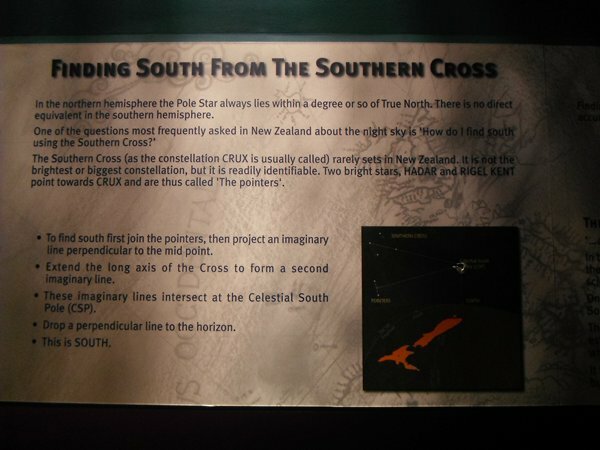 Being on the east coast and not that far from the west coast, Auckland gets all the weather, whichever direction it comes from. 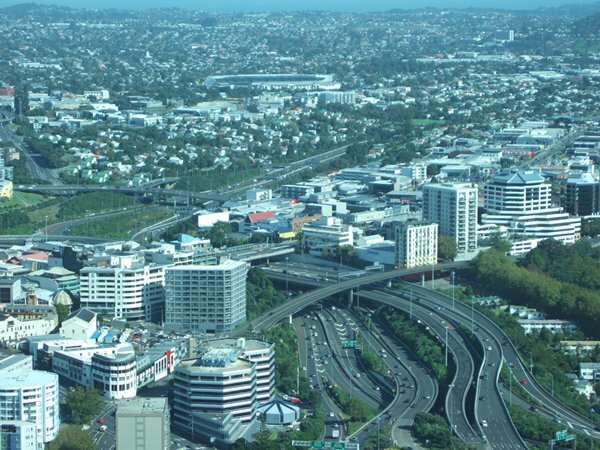 A commentator on the radio not too long ago suggested that most Aucklanders don't know much about cricket as it seldom stays dry long enough to finish a game! 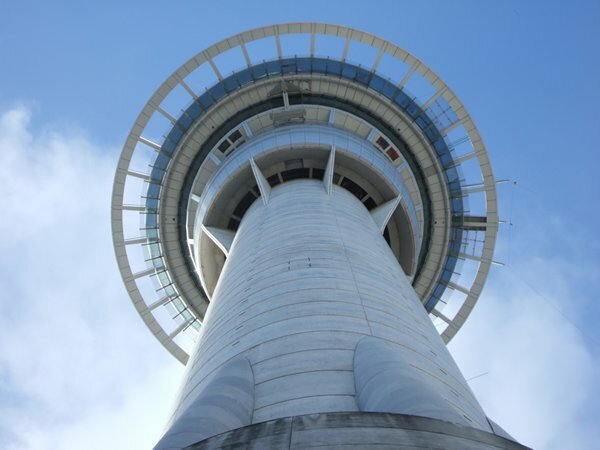 But by the time we arrived the rain had cleared and for once we could even see the top of the Sky Tower (it's normally been in the clouds). 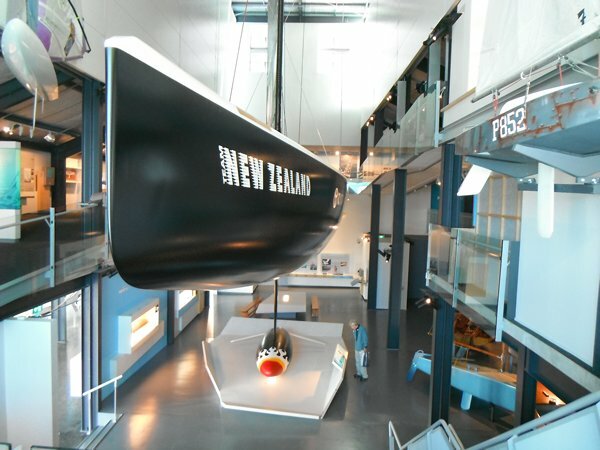 One of the aims of wanting a last trip to Auckland was to also do the tourist bit - see Queen Street (equivalent to Oxford Street), walk along the redeveloped water front and visit the maritime museum. 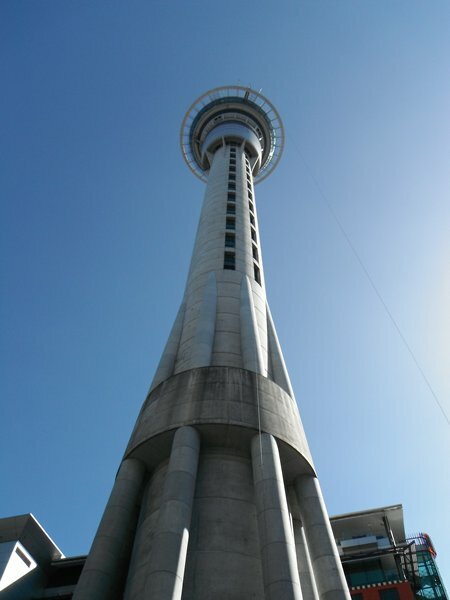 But a sunny day in Auckland, with hardly a cloud in the sky, could mean only one thing - a great opportunity to make a long awaited trip up Sky Tower. 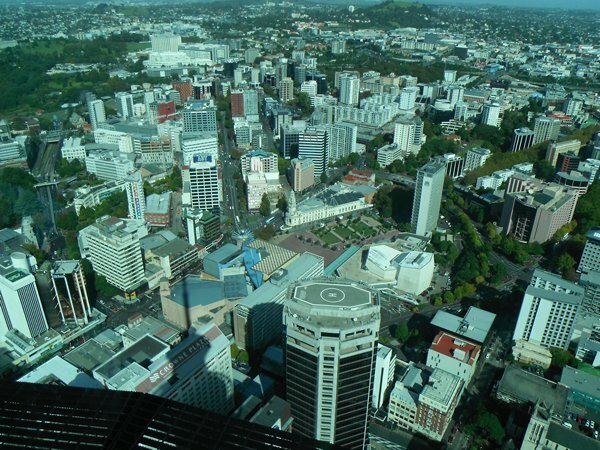 So a quick shop in Queen Street and then a walk round the corner to the Tower - the centre of Auckland is all very compact, so everything is only a short walk away. 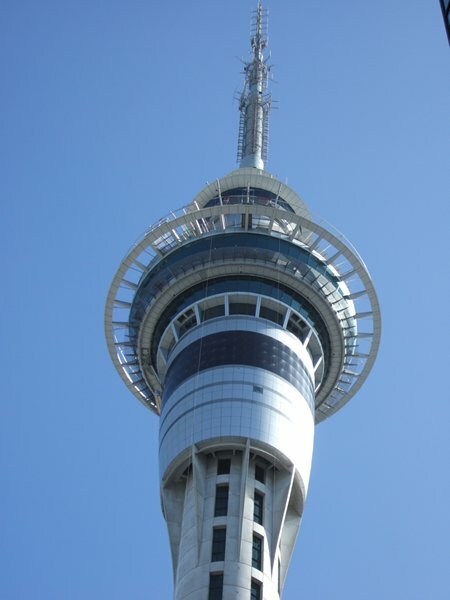 Sky Tower is 328 metres high (1076ft) and the tallest building in the Southern Hemisphere. 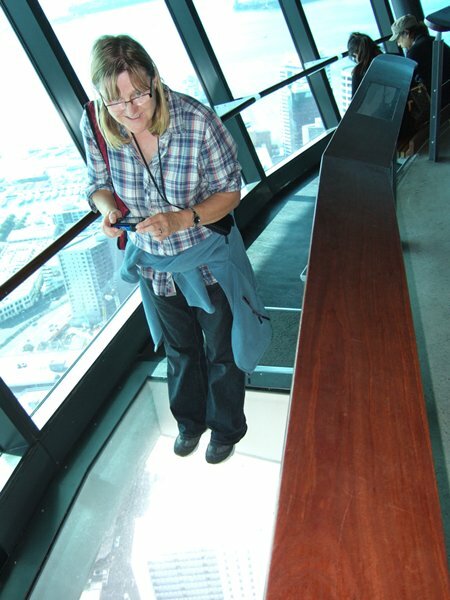 So it's a lot taller than the London Post Office Tower which is 189 metres (620ft) and almost twice the height of Spinnaker Tower which is 170 metres (557ft). The weather stayed fine and the views in every direction were just fantastic, and well worth the 16 month wait! From there it was a quick 2 hour visit to the maritime museum. 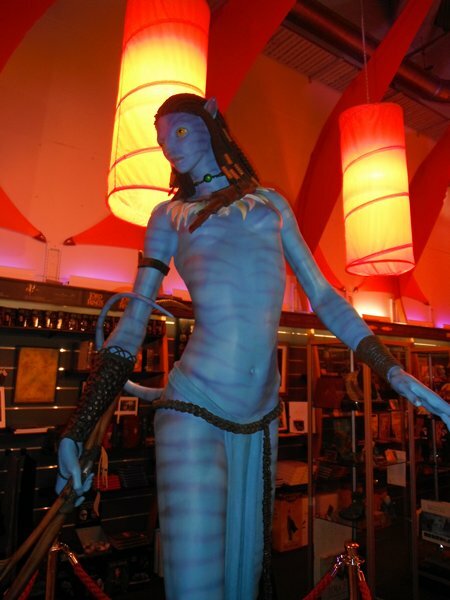 We could easily have spent 2 or 3 times as long had it not been closing at 5pm. 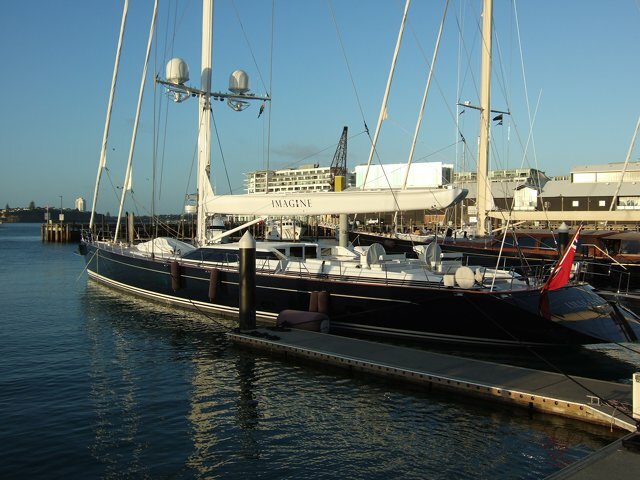 Then a walk round the waterfront at Viaduct Basin to look at the superyachts moored there and take in the views of the city as the sun went down, still with not a cloud in the sky. 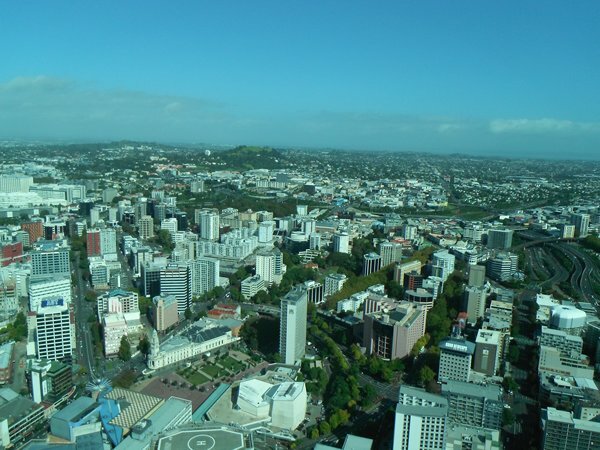 It had been a lovely sunny day in Auckland and one we will remember for a long time. and there was no wind! 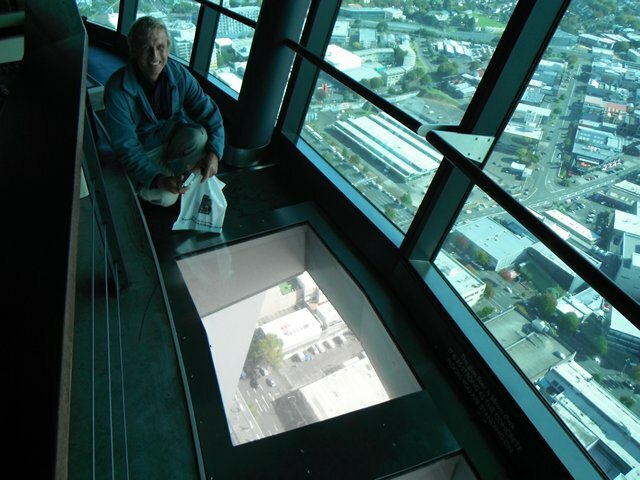 There are 2 observation galleries, one below the fringe and one above it. 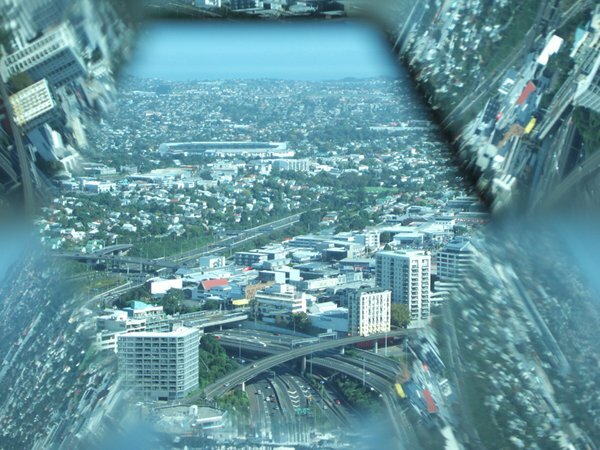 Fantastic views all round and the top Sky Deck has seamless glass, so no frames to get in the way. 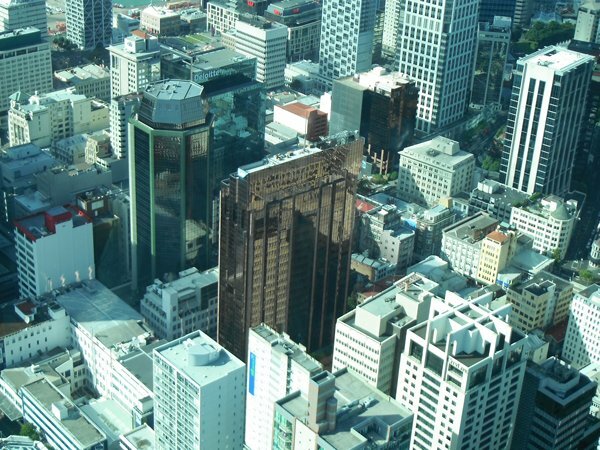 Auckland CBD (Central Business District) surrounds the tower - all very close together! Looking down on the helipad. 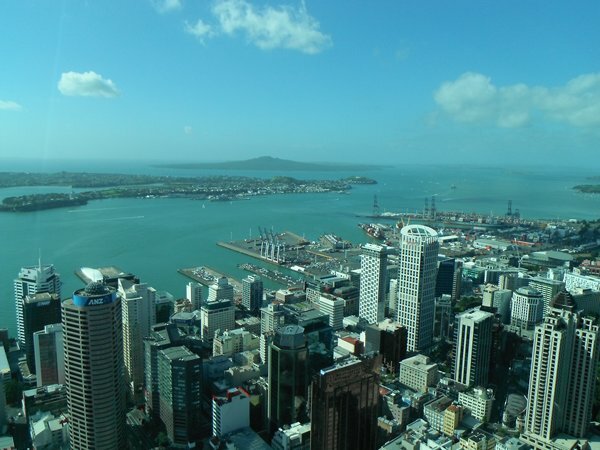 Looking east over the docks and on to Rangitoto, one of the extinct volcanoes that surround Auckland. 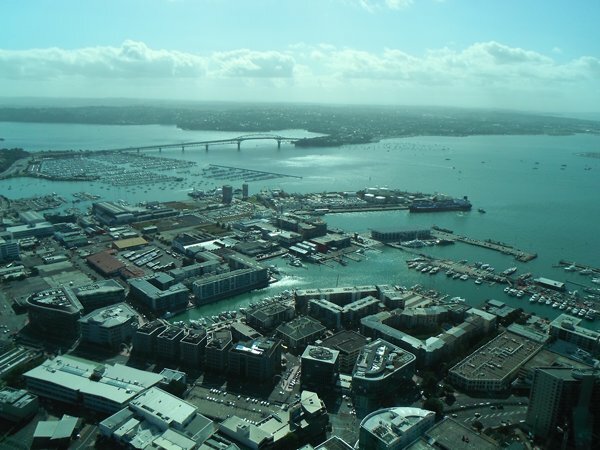 Basin (redeveloped for the Americas Cup) in the foreground - where the superyachts stay. ......... some brave people walk on! 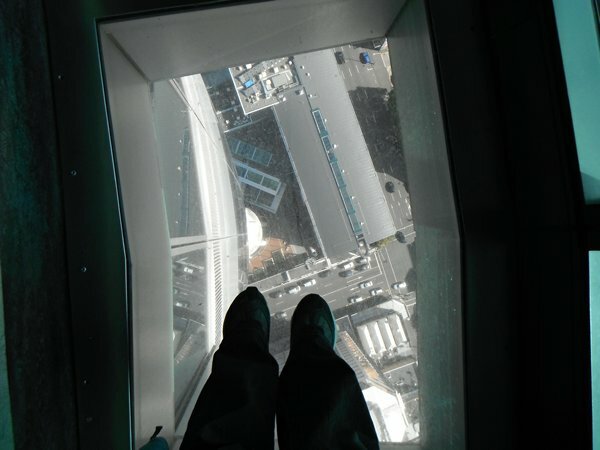 A long, long way down - they say the glass floor is stronger than the concrete floor. I'm not convinced! 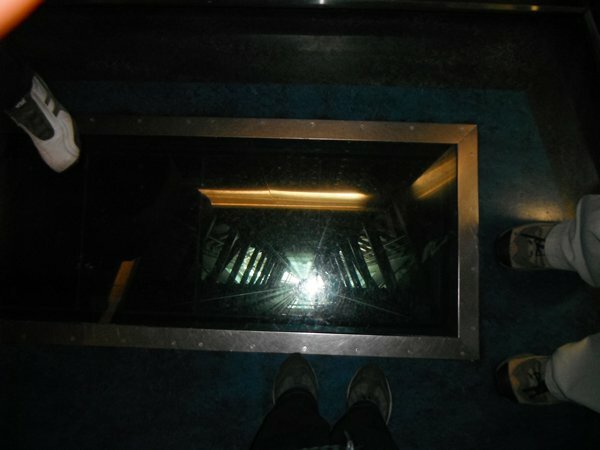 Even the lift has a glass floor. in this case. 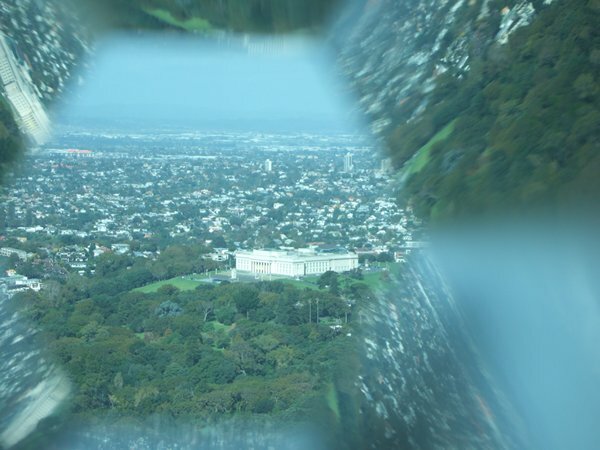 Taking a picture through it gave quite interesting results. 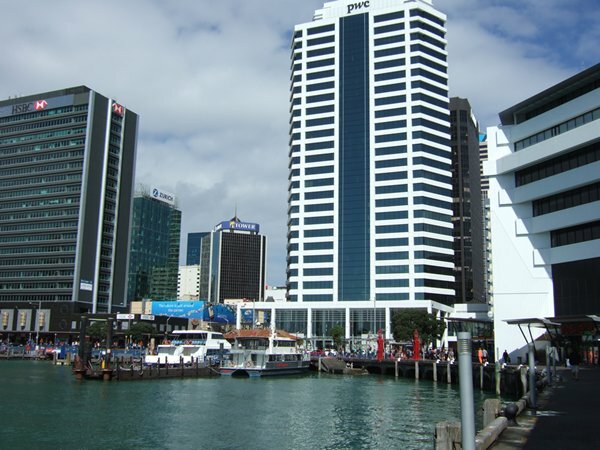 - the New Zealand based film workshop - created. Mostly Avatar, Lord of the Rings and Tin Tin. 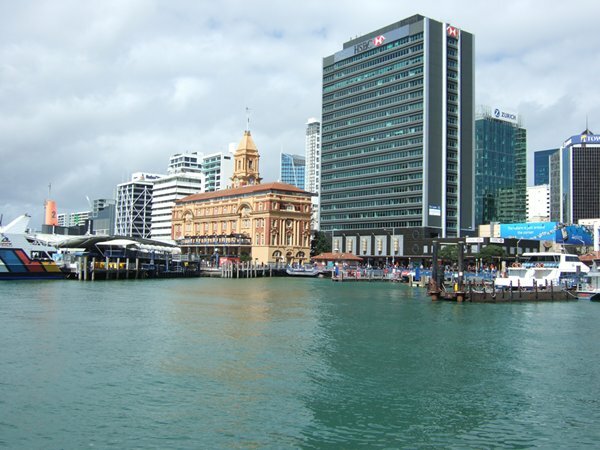 The old (Ferry Building) and new side by side. The waterfront where the ferries arrive and depart from. Sculptures of albatross on the quay side. campaigns. There was a whole section dedicated to Sir Peter Blake and all his achievements. next night passage we hope we're heading in the opposite direction - north and warmer climes! 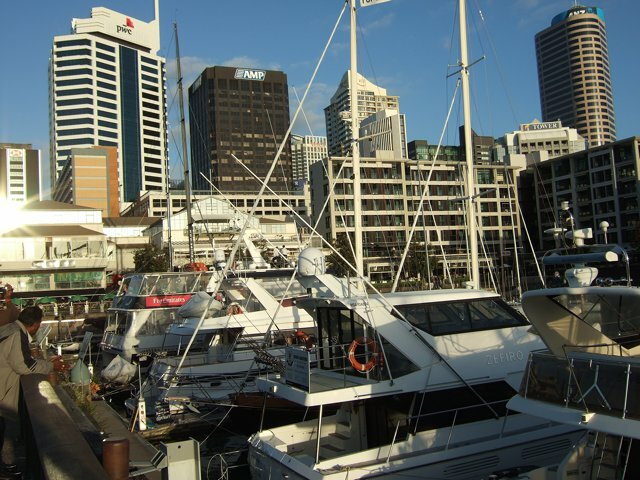 Boats on the edge of the city centre. 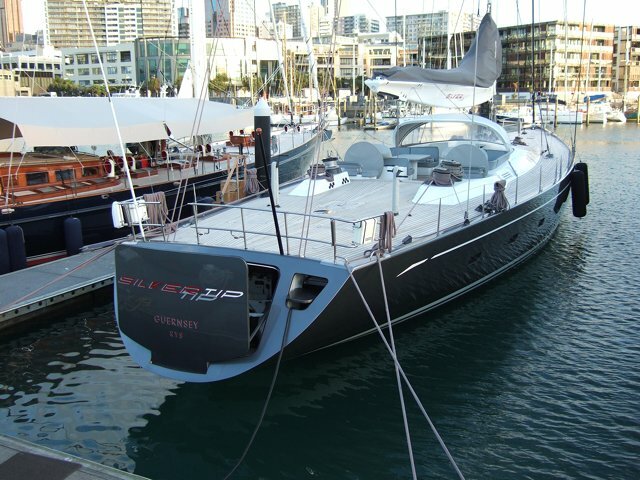 Imagine owning this, and imagine the running and maintenance costs! 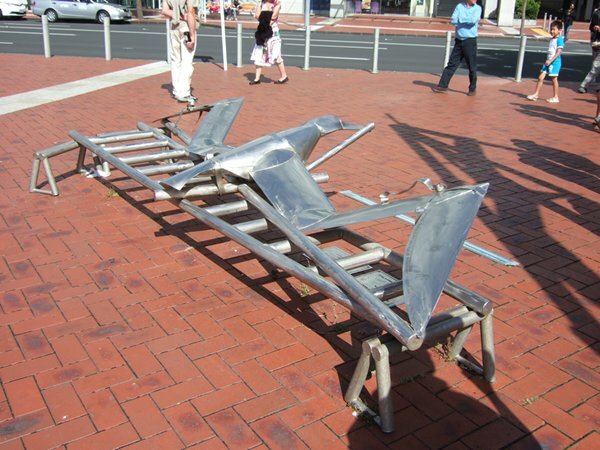 (pictured below) was registered in London.